With the current onslaught of Palestinian terrorism against Israelis and isolated incidents of Jewish terrorism against Palestinians, 3,000 volunteers – Jewish, Muslim, Christian, Druse and Bedouin clad in orange, black and white vests – are working around the clock to save lives. The Kafkaesque, ironic situation is clear to the outside observer, but taken for granted by the medics and paramedics of United Hatzalah on ambucycles, whose aim is to reach any injured or sick person needing help within 90 seconds of being called. Noted French-Jewish producer and director Jose Ainouz spent six months following UH volunteers and chronicling their good deeds to make a 66-minute film about them. Although he had not been involved with Israel before, he was entranced with the organization and the country, bought a home here and has decided to make aliya. 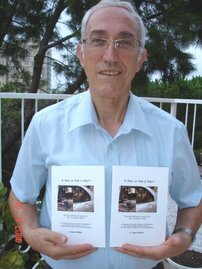 Called “The Ambucycles of Life”, see trailer at https://www.youtube.com/watch?v=fItSUmJ0Un4 the action-packed movie is meant for “not by the people who love Israel or those who hate Israel, but those who are neutral,” says UH founder and president Eli Beer. “The first are already convinced that Israel is wonderful; the second are convinced that Israel is horrible. We want to reach the others who don’t know about what we do.” It appears in Hebrew, English and French versions. United Hatzalah of Israel is the largest independent, non-profit, fully volunteer Emergency Medical Services organization, providing the fastest emergency medical first response without charge throughout Israel. United Hatzalah’s service is available to all people, regardless of race, religion or national origin. Beer launched the ambucycle idea in Israel, as Magen David Adom ambulances are very often held back from reaching the sick and injured because of traffic congestion, road closures, debris and parking problems. Eventually, the MDA ambulances take the patient to hospital if additional care is required. Beer has been involved in the idea of emergency medical rapid response since 1988, when, as a teenager, he observed a Jerusalem bus exploding from a terrorist bomb. He decided to take an MDA first aid course. But when he saw that it often takes time for help to arrive, he fine-tuned his idea of ambucycles and helped establish UH in 2006, following the Second Lebanon War. Since then, he and colleagues have dedicated themselves to unifying the level of professionalism, training and efficiency of the disparate Hatzalah organizations throughout Israel. THE AMBUCYCLE contains everything needed by medics and paramedics (except for a bed). The storage box on the back has advanced lifesaving equipment sized to fit the unique operational requirements and configuration limitations of an ambucycle. In addition to the complete trauma kit, the box contains a specialized oxygen canister, blood sugar monitor and defibrillator. All the medications that could be used are inside in small doses, regularly replenished by volunteers. Each of the hundreds of ambucycles responds to some 40 calls per month, roughly 480 calls a year. About a quarter of these calls are critical lifesaving situations. Each ambucycle is on the road responding to emergencies for at least three years, and therefore will enable volunteers respond to around 1,440 calls and will save 360 lives. Last year, more than 650 people were helped by UH volunteers on an average day, with an annual total of about 240,000. Having the well-trained, equipped and motivated medics ready to race to save someone’s life is useless, said Beer, unless you have a system that locates, alerts and guides the medic to the scene in the quickest and most efficient fashion. These motorcycles, including all required medical equipment, maintenance, and insurance, cost about NIS 100,000 each. The LifeCompass system, developed in cooperation with NowForce, draws a virtual perimeter around an incident that has been entered into the system. It then alerts only the medics in a predetermined radius to the incident. Each volunteer knows that when the LifeCompass alerts him, it is because he is in the immediate vicinity of an emergency incident. Complete GPS guidance to the scene and recording capabilities ensure that every incident is responded to and recorded. The organization even has a small boat from which they save people from drowning in the Kinneret. Beer noted that the aim of UH is not only saving lives, but also developing unity among volunteers. A gamut of Hassidim who usually wouldn’t speak to each other – Lithuanian- style ultra-Orthodox (haredi) Jews, modern Orthodox, Chabad Hassidim, secular Jews, Christian, Beduin and Druse – work both separately and together. All funds, he added, come from donations from Israel and abroad. Gitty Beer, Eli’s wife, noted that not only the medics and paramedics sacrifice by being ready to get up and go any time of the day or night, including Shabbat and festivals. Medics can qualify for UH if they have passed their 21st birthday, have a vehicle license and have a clean police record. They take a theoretical and practical course of 160 hours. After working with a trainer for a certain amount of time, passing tests and proving themselves, they are allowed to go out on their own. WHEN BEER realized that it was difficult for his Jewish volunteers to enter eastern Jerusalem and other Arab areas, he thought of training people from that sector to be medics as well. Some even volunteered at their own initiative. One man asked to take a course after he saw his own father collapse at home and die while the family waited for an ambulance for almost an hour. A UH branch was opened in the eastern part of the capital. “My intention was to save people,” he said. In emergencies, West Bank Palestinians bring patients to the gates of Jewish settlements to get good treatment. If needed, UH transfers them to PA hospitals. There are 10 Druse volunteers in the north. In addition, more than 40 Beduin women in the south learned to be medics after realizing that their large families would be safer if they studied first aid. Going on their rounds, UH volunteers also encountered many elderly people living alone who need help. As a result, the organization set up a special program to visit them and talk to them. A total of 250 volunteers now visit some 70 lonely people who sought company, most of them Holocaust survivors. “My dream," concluded Beer, "is that in 15 years or so, every neighborhood and street in the country will have a UH volunteer. No one will wait for help for more than 90 seconds. We also want countries around the world – from America to Africa – to copy our model."